After the first two winter storms of the year did nothing but lower Northern Colorado’s collective faith in local weather forecasters, we finally got our real snowfall of the year over the past few days. After a predominantly grey and shivery Thanksgiving weekend, the clouds finally revealed some blue sky today so I headed out to Horsetooth Reservoir for a few hours to grab some photos before the afternoon slate of NFL games kicked-off. 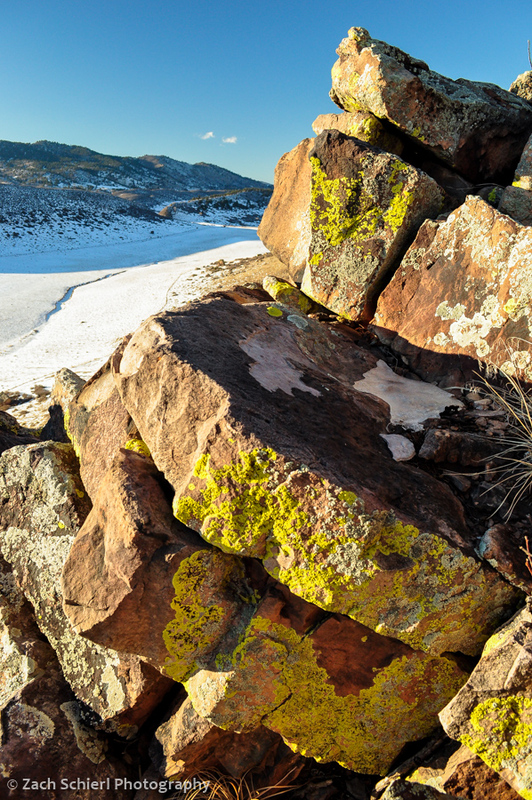 Horsetooth Reservoir is a local landmark and apart from the obvious water-based recreational opportunities, there are several world-class bouldering spots located along the east shore of the reservoir that make for some interesting winter scenes. I half expected to see some bold (feel free to pick a stronger word if you prefer…) boulderers throwing caution to the sheets of ice coating most surfaces, but despite this location’s proximity to Fort Collins (~10 minutes), I was pleasantly surprised to have the place all to myself. With no boats on the reservoir and two ridgelines separating me from the ongoing holiday shopping hustle and bustle down below, Horsetooth was unusually serene. A popular bouldering spot at Horsetooth Reservoir; a bit slick today! After wandering around for nearly an hour, I began to notice that nearly every branch and blade of grass was encrusted in about a half inch of crystal-clear ice. Not only that, but the ice had invariably accumulated on the east side of the vegetation, suggesting some fairly persistent west winds over the past few days. A far cry from the sunny serenity of Sunday afternoon! 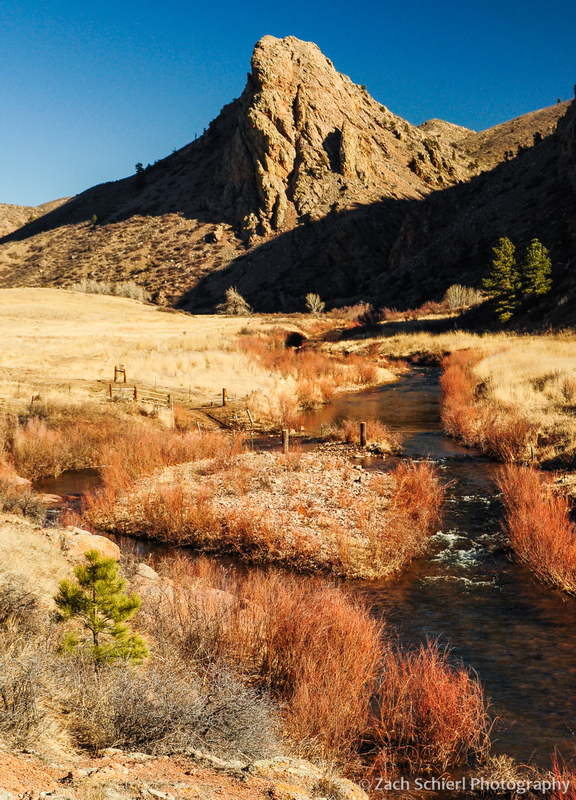 Earlier this winter we took a day trip up Poudre Canyon, about a half hour northwest of Fort Collins. One of the more popular trails here is a ~5.5 mile loop combining the Greyrock Trail and the Greyrock Meadows Trail. A short spur trail heads up to the summit of Greyrock Mountain (pictured above) near the apex of the loop but we opted to pass on this route due to icy conditions and dwindling daylight. Despite ranging in elevation from 5,500-7,000 feet, the trail was surprisingly snow free, save for the lower sections that were well-shaded by the canyon walls. 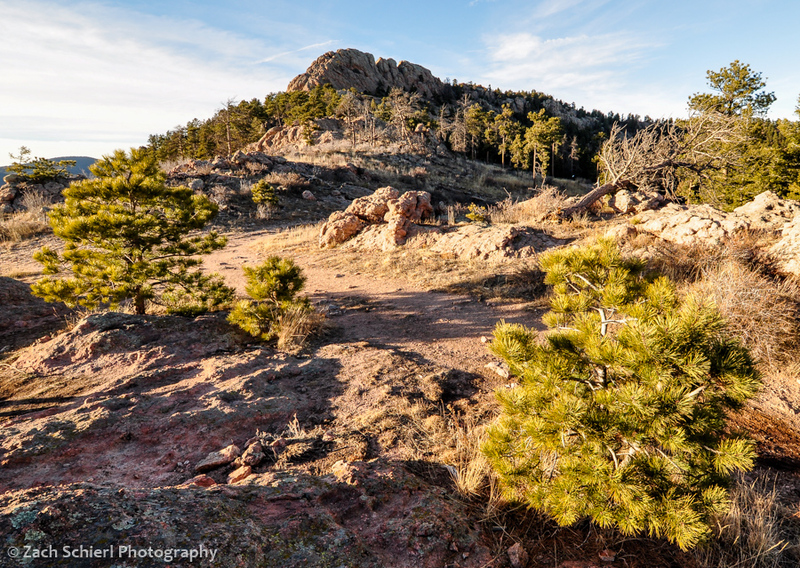 The highlight of the hike is most certainly the spectacular granitic rock formations surrounding Greyrock Mountain. I say granitic because the rock here is actually not granite but what geologists call quartz monzonite; essentially granite with slightly less quartz and slightly more feldspar (hence the pinkish color). A seemingly trivial difference perhaps but an important one to geologists trying to unravel the history of the rocks. The steep, smooth faces of Greyrock Mountain wouldn’t look out of place amongst the granite domes of Yosemite National Park. There’s also some good sized pegmatite dikes that criss-cross the area. We found some very large and attractive quartz and feldspar crystals poking around the meadows that surround Greyrock Mountain. Standing on a large pegmatite dike looking down into Greyrock Meadow. The continuation of the dike can be seen as the prominent vertical pink stripe on the hillside just beyond the meadow. One of many large, recently downed Ponderosa Pines on the Greyrock Meadow Trail. On the hike back down to the trailhead (on the Greyrock Meadows Trail), we were treated to a spectacular sunset over Poudre Canyon as well as views of the distant Mummy Range in Rocky Mountain National Park. Horsetooth Rock, a famous Fort Collins landmark, is composed of hard Precambrian pegmatite. It is currently snowing so hard I can barely see across the street. Fortunately, I haven’t been able to say this very often this winter, and I strongly suspect it won’t even be true 10 minutes from now. After six winters in the Pacific Northwest, once again residing somewhere where “warm” and “dry” are not mutually exclusive weather conditions has been quite refreshing. The mild weather has made hiking and all the other outdoorsy things that are practically a prerequisite for obtaining a Colorado driver’s license quite enjoyable. I’ve written about some of my adventures up to Rocky Mountain National Park but have yet to share any photos of our more immediate surroundings here in Fort Collins. Fort Collins itself, lying at the extreme western edge of the Great Plains, is…well…flat. The only sledding hill I’ve yet seen here is a pathetic 20 foot run down the side of a large pile of gravel in the corner of the college football stadium parking lot. (As you’ll notice though, there is very little snow in any of these photos, so this is sort of a moot point.) Immediately west of town though lie the foothills of the Rocky Mountains, a beautiful landscape of ridges and valleys that mark the boundary between the plains and the Rockies. Overlooking Fort Collins just before sunset from cuestas (ridges) between town and Horsetooth Reservoir. Colorful lichens coating sandstone ledges of the Cretaceous-age Lytle Formation, Coyote Ridge Natural Area. Geologically speaking, the foothills are fascinating (though geologists find just about any landscape fascinating…heck even Iowa has one of the largest asteroid impact craters on Earth lurking just beneath its surface) because they represent where the Rocky Mountains pushed their way up through the crust. Prior to the uplift of the Rockies, this portion of Colorado was covered in a thick, continuous stack of colorful but more or less flat-lying sedimentary rock layers, much like one sees at the Grand Canyon today. Eventually, the Rockies thrust their way upward through the sedimentary rock, forcing the formerly flat layers to tilt toward the east. Over time, the softer sedimentary layers were (relatively) easily eroded away, forming long north/south trending valleys. Other layers were harder and resistant to erosion, forming dramatic sloping ridges known as cuestas and hogbacks that parallel the valleys. The resulting pattern of alternating ridges and valleys is striking and has practical uses as well. In many places, streams flowing out of the mountains have been dammed at the point where they slice through the ridges, forming long, slender reservoirs that flood the valley bottoms. Horsetooth Reservoir, which provides some drinking water for Ft. Collins and irrigation water for the plains, is perhaps the best example. Devils Backbone, a nearly vertical hogback of Dakota Sandstone south of Fort Collins. Slightly further west, the landscape changes as the sedimentary layers give way to the igneous and metamorphic rocks that compose the bulk of the Rockies, forming famous local landmarks such as Horsetooth Rock (above) and Arthur’s Rock. The plethora of city, state, and county parks that protect large swaths of the foothills are increasingly important as the cities below the foothills encroach on wildlife habitat. Mammals like deer, elk, bobcat, and bear are abundant in the foothills. As the cities below continue to push up against, and even into, the foothills, it’s not uncommon to read stories in the local newspaper about a moose, bear, or mountain lion wandering into town.